Think about the best sales person on your staff for a moment. Do you have a name in mind? Think about what this person knows and what he does for your company. For example, he knows the business and all your products and services like the back of his hand. He knows a whole lot about your customers – their demographics, their problems, their wants and needs. He even knows how to get your prospect’s contact information so that he can follow up with them again and again. Now imagine this person gave up all his free time to devote to your business. Imagine he even gave up sleeping just so he could talk to your customers at any time of the day or night. That’s right, now he’s working for you around the clock to capture leads, build relationships with the prospects, and close sales. So tell me, how much would you have to pay this sales person to work 24 hours a day, seven days a week for you? It’s an eye-popping six-figure sum, no doubt. It wouldn’t come cheap. Now compare that salary figure to the cost of a website. Even a $25,000 website is an absolute bargain when you compare the two. And that’s because a website is your dream employee – it works 24/7 for you to capture leads, build relationships and close sales. Your website truly can be the best sales person on your team – and yet it costs less than your employees. However, this is only true if your website isn’t a glorified brochure. I mean think about it – if you hired a sales person and all they did was hand out brochures to prospects, you’d fire them without a second thought. That’s because you expect them to do more. A good sales person meets clients when he’s looking his best (e.g., wearing professional attire, well groomed and clean). This makes a great first impression on prospects. Likewise, your website needs to looks polished and professional in order to make a great first impression. That’s why you need to have a top design team like the one at Hire a Wiz to develop your site so your business can put its best foot forward. Other contact information (e.g., email address). Who can benefit from your products and services. What all your products and services do for customers. Why people should choose your business over the competitors. A good sales person gets the contact information so they can follow up with a prospect. Likewise, your website needs to havea system for capturing leads onto a mailing list. Generally, you do this by offering a really enticing freebie (AKA lead magnet) in exchange for an email address. Then you load a series of emails into an autoresponder to follow up with your prospects automatically. A good sales person always asks for the sale – and so should your website. This means your site should include multiple clear calls to action. These calls to action might direct prospects to buy a product, join a mailing list, call your company, or anything else that supports your business goals. Provide clear benefits and reasons to purchase the product. Offer risk reversal (a guarantee). Offer social proof, such as testimonials. … And every other part of the site or sales process that is likely to impact sales. A good sales person is a good representation of your brand, and your website should do the same. Your site’s design, sales copy, FAQs and everything else should reflect the brand and be a good brand ambassador for your business. A sales person is responsive to the prospect’s needs. For example, if a prospect is hard of hearing, then the sales person speaks up. 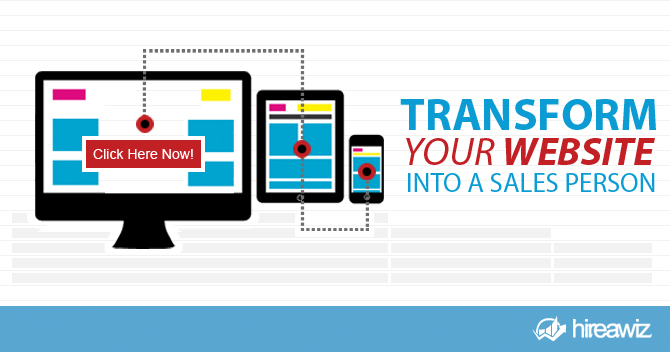 Likewise, your website needs to be responsive to your visitor’s needs. One good way to do this is to install a responsive design, so that your visitors have a good experience no matter what device they’re using, from a smart phone to a tablet to a desktop computer. If you plan your website carefully, then it can be the very best sales person on your entire staff (and you can get it at the fraction of the cost of your salaried employees). Problem is, most businesses just put glorified brochures up as websites. That gives you a web presence, but it won’t give you the results you desire like more leads, more customers and more sales. Solution? Your website needs to be a work horse, not just a show horse. And that’s why you’ll want to get in touch with the experienced web development and marketing team at Hire a Wiz. Not only can we create a stunning website that makes a great first impression on your visitors, we’ll also ensure your site is the best sales person on your entire staff. Learn more now by getting in touch with our experienced team – your first consultation is free, so get in touch today!